Amboseli is almost as popular as the Masai Mara, and is located on the southern side of Kenya near the Tanzania border . From Amboseli, there are superlative views of the snow topped Mount Kilimanjaro that offer a great picture perfect shot as a background. 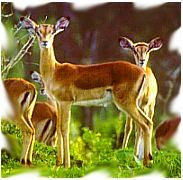 The marshlands and rich grasses of the central area have large concentrations of wildlife. Amboseli is a place of stark contrast. Meaning a "place of water" in Maasai. Amboseli is a spectacular national park to visit in its own right. 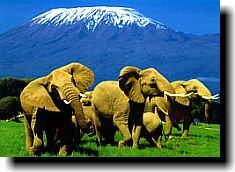 It is not just the wildlife that attract visitors to Amboseli in Kenya but also the magical Kilimanjaro, the highest mountain in Africa at 5,985m (19,340 ft). Though Kilimanjaro seems so close from Amboseli flat open plains, its peak is almost 60 km (37 miles), and also across the Tanzania border making it a must destination when extending out for a Tanzania safari into Serengeti, Ngorongoro, Lake Manyara and Tarangire. Amboseli National Park has a unique ecosystem and a variety of game. 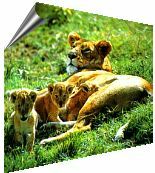 There are five different wildlife habitats - The seasonal lakebed of Lake Amboseli, swamps and marshes with a few sulfur springs, open savannah plains, yellow barked acacia woodlands and the lava rock thorn bush country. Amboseli is the best safari park destination in Kenya to experience the elephants in huge numbers, and Ol Tukai Lodge is one of the accommodations you could stay in. In addition, there is a large concentration of Maasai giraffes, buffalos, zebras, elands, Coke's hartebeests, waterbucks, gazelles and Impalas. Cheetahs and lions are sure bets.